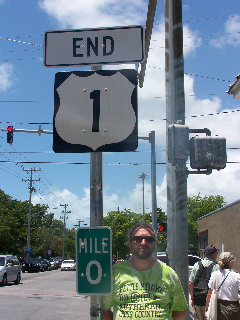 Having fulfilled my goal to place a box on the north end of Hwy 1 in Fort Kent, ME, I finally got a chance to go back to Florida and place a box at the southern terminus of Hwy 1 in Key West, FL on a trip south in the summer of 2009. I also placed a box at the southern end of Hwy 41 on the same trip! Start in Fort Kent, ME and take Hwy 1 south 2209 miles to Key West, FL to its very end at the intersection of Fleming St. and Whitehead St. This end is easy to find since Hwy 1 is the main road through the Florida Keys, and the mile markers you pass count down your approach to the end. The hardest part is to find a good place to park. Once you are parked, make your way to the markers. Spend some time taking your picture at both the end and beginning of Hwy 1. If you are interested, there are numerous places in town where you can buy a "Mile 0" or "End Hwy 1" sticker, shirt, shot glass, etc. Once you are ready to find the box, travel southerly down Hwy 1 (Whitehead St.) on foot from the sign marking the beginning of Hwy 1. On the west side of the street are local government buildings. Find the huge old tree in front of the courthouse. There are a couple of signs telling you about the tree and the end of Hwy 1. Go to the back of the tree (the side facing the courthouse) and you'll see that the tree roots above ground form a large bowl as the roots curl around. On the north side of this "bowl", two of the roots come very close to one another as they parallel each other. Where the space between them is the tightest, you will find the box squeezed in between the roots with leaves, sticks, and a large rock on top. Note how the box is VERY WELL COVERED and SNUGGLY in place! Be sure to place the box back in the same way so it does not come loose or is accidently discovered. Thanks!